Rony Talukdar's 38-ball 66 blitzkreig couldn't take Dhaka Dynamites over the line in the high-voltage contest. The final of this edition’s Bangladesh Premier League (BPL) turned out to be an absolute crackerjack. Comilla Victorians and Dhaka Dynamites fought tooth and nail at the Sher-E-Bangla National Stadium. After all the excitement, the Imrul Kayes-captained Victorians won the game by 17 runs and clinched the title for the second time after 2015. Shakib Al Hasan’s Dhaka lost their second final in a row after 2017. The Dynamites’ decision to bowl first boomeranged on them big time as the Victorians racked up a colossal 199 in 20 overs. Rubel Hossain nipped out Evin Lewis early, but Tamim Iqbal was in no mood to die wondering. The left-handed batsman plundered 141 runs in 61 deliveries and his awe-inspiring knock was laced with 10 boundaries and 11 sixes. He didn’t go hammer and tongs right from the outset. Tamim was severe on every other bowler and kept depositing everything that came his way. The other batsmen tended to strain a wee bit. 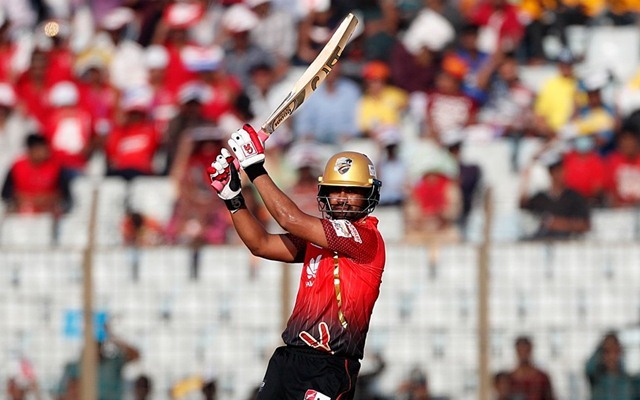 Anamul Haque Bijoy, who shared a partnership of 89 with Tamim, could only score 24 runs in 30 balls before falling prey to Shakib’s guile and trajectory. Shamsur Rahman perished for a golden duck. Imrul Kayes also found it hard to time the ball and ended with 17 runs. Mohammad Saifuddin ran Sunil Narine out in the second ball as Shakib’s men got off to the worst possible start. However, Upul Tharanga and Rony Talukdar put on 102 in 52 balls to bring their team back into contention. Both batsmen played their strokes freely and didn’t seem fussed. Thisara Perera separated the ominous-looking duo, dismissing Tharanga, who managed four fours and three sixes. Shakib couldn’t get hold of a short ball from Wahab Riaz and got out for three. Anamul Haque threw down the stumps at the non-striker’s end to nip out Talukdar after he threatened with 66 runs from 38 balls. In the last five overs, Dhaka required 59 runs and the onus was on Kieron Pollard. The hulk-like batter fell prey to Wahab and after that, things went downhill for Dhaka and they couldn’t recover. Congrats Tamim Iqbal for your brilliant knock in the BPL'19 final.